Players will be able to upgrade weapon types in Dead Rising 3 so that they require fewer materials to craft. Past Dead Risings have featured multiple story endings and now, Capcom has confirmed that Dead Rising 3 will be no different. "I think typically we've always had about somewhere between six and 10, something like that," said producer Mike Jones. Much like previous games the story of this latest entry in the franchise will change and shift depending on player's actions. "There's a handful of branching points that make a significant difference," he said. The way you respond during these moments of choice will in turn determine "whether you're able to play beyond the normal timeline of not." In addition to offering details on the way the game's story would progress, Jones also discussed its experience and customization mechanics. When players level up, they'll earn attribute points that can be spent on a variety of different categories. Points can also be used to upgrade different weapon types, something that can help make it easier to craft new weapons from scratch. "Ultimately, you can combine anything with anything, anywhere," said Jones. This level of freedom could to appeal to players, many of whom enjoyed past Dead Rising games in no small part because of the liberty they granted to combine found items into often wacky weapons. 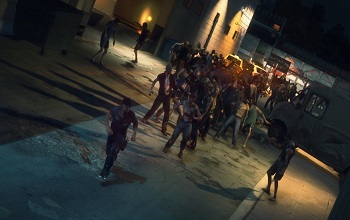 All in all, we'll be interested to see how the leveling system in Dead Rising 3 plays out. While the ability to upgrade your weapon stats to the point that you can turn scissors into swords definitely sounds neat on paper, there could be an arguable risk of it making things a bit too easy. Then again, it will probably take some time to get to that level of skill and Dead Rising has always partly been about finding the best ways to rack up the highest body count. That in mind, these abilities could fit right in.